There aren't any Patriot League title considerations at play this weekend at Murray Goodman Stadium, but there's a whole lot to play for in this intense Patriot League rivalry. If you can't make it to the game, you can catch the contest on TV on Service Electric 2 in the Lehigh Valley, with Steve Degler, Doug Heater and Kristi Fulkerson on the call. That Service Electric 2 broadcast is also streamed online for free via the Patriot League Network. It's November in the Valley and also at a time when the foliage around Murray Goodman Stadium will be at its fiery best. It's going to be chilly, with a high of 48 combined with some really gusty winds. 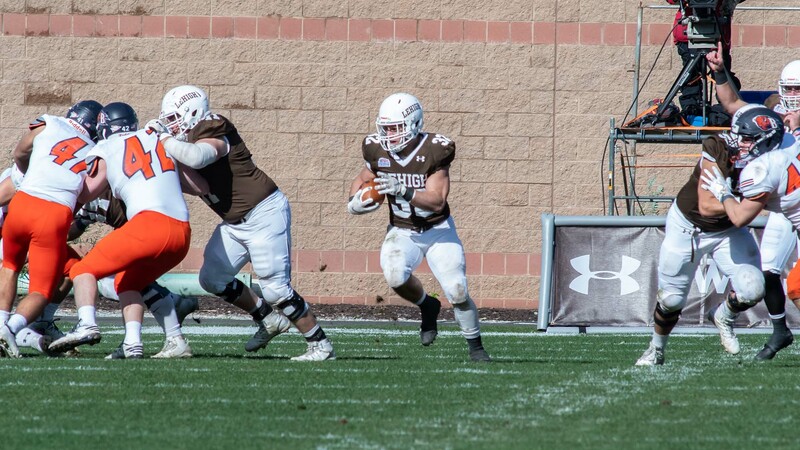 It might make for interesting football and might dampen the passing game somewhat that Lehigh seemed to rediscover last week. It's Family Weekend at Lehigh. In years past family weekend has meant fairly big crowds (well by recent standards, anyway) and has also been a three-day affair where parents and siblings come by to visit, of course. On Friday there are tours, open houses, an A Capella concert at Packard Lab, and a volleyball game at Grace Hall, among other things. Football-wise, more importantly, Family Weekend has a great tailgate available, the Family Fest Tailgate outside of Murray Goodman. The huge white tent involves, for $30, a huge buffet and open bar for adults, and a discounted rate for kids. Best of all it starts at 10:30 AM - a little bit earlier than most gamedays. It doesn't include a ticket, but with that open bar, it's a pretty good deal. If you're coming into the Colgate/Lehigh rivalry (with a little r) for the first time, here's a primer to get you up to speed as to what Colgate/Lehigh means for both programs. As you'll see, both programs have been sort of like fighting siblings for quite a long time. Lehigh and Colgate first met back in 1922, in a world where Lehigh was searching for its identity as a college football program and Colgate had already begun to establish itself as a national championship-caliber program. "Colgate overpowered the fighting Lehigh eleven Saturday in one of the hardest-fought games of the season by the score of 35 to 6," The Brown and White said in their recap of that 1922 contest. "The game was played in the First Ward Stadium, Binghamton, New York before a crowd of about ten thousand. There were about three hundred Lehigh students there, a great many of whom 'bummed' their way to the stadium. It was an enthusiastic crowd, they cheered their loudest even when the team seemed hopelessly overwhelmed." Though a promising beginning to a Lehigh/Colgate rivalry, the two teams wouldn't meet again, oddly enough, until 1960. It was that year when the two schools started an arrangement to play each other yearly in home-and-home series in football, a situation that continued all the way until 1975. For Colgate, the series made a boatload of sense. Lehigh provided critical home games every other year, while Colgate, even back then, had a reputation of being a team of road warriors. In the years Colgate played Lehigh at home, they would only stage three home games a year on their nine game football schedule; in the games where Colgate played at Bethlehem, they'd only have two. In that fifteen year stretch, there were some hard fought games between the two schools. But legendary Lehigh head football coach Bill Leckonby coached two teams that beat Colgate. By 1973 and 1974, after a long winning drought against Colgate, Lehigh started to win football games consistently against their Chenango Valley neighbors with teams headed by another great Lehigh head football coach, Fred Dunlap. Dunlap. whose athletic career started at Colgate as a letterwinner in both football and wrestling, built and recruited much of the talent that would beat those Colgate teams and set the foundation for Lehigh's eventual 1977 Division II National Championship run as well. 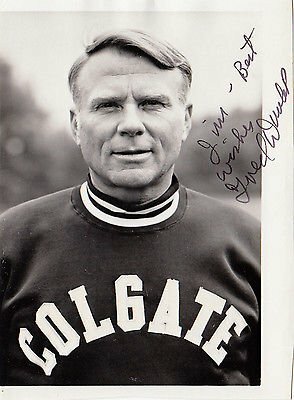 Colgate thought so much of Dunlap that they hired him away from Lehigh at the conclusion of the 1974 season, with his replacement, the legendary John Whitehead, coming from Dunlap's staff. "One of the reasons I came was that we lost so many recruits to Colgate," Dunlap remembered years later. "Back then, Colgate was Division I and Lehigh was Division II, but we were competitive in those days." After a brief lull, Lehigh and Colgate became regulars on each others' football schedules in 1978, and they've played every season since - even before the formation of the Patriot League, where an already-big rivalry (with a little r) blossomed into something bigger. One of the more remarkable aspects of the Colgate/Lehigh series is that, since becoming members of the Patriot League in 1986, no team has won more than three games in a row. Every four-year member of the Lehigh and Colgate football teams have enjoyed victory over the other since 1990. There's also the critical element that in many years, the Colgate/Lehigh winner has gone on to win at least a share of the Patriot League title, and qualified for the FCS playoff autobid that the Patriot League provides. The last three seasons that pattern has held up, though whether that trend still holds will be determined after this weekend. Colgate (2015), Lehigh (2016), and Lehigh (2017) all made the FCS playoffs and were Patriot League Champions (with Colgate additionally qualifying as co-champions in 2017 as well). If Colgate wins this weekend, it will mark four straight years that the winner goes to the playoffs and wins the Patriot League. The Lehigh/Colgate rivalry is one that has remained relevant over the last two decades because of the sustained excellence of both teams in league play, and has become a game for both schools to circle on the calendar for that reason alone yearly. They are two brothers with two different styles of play that clash once a year in a big league game. 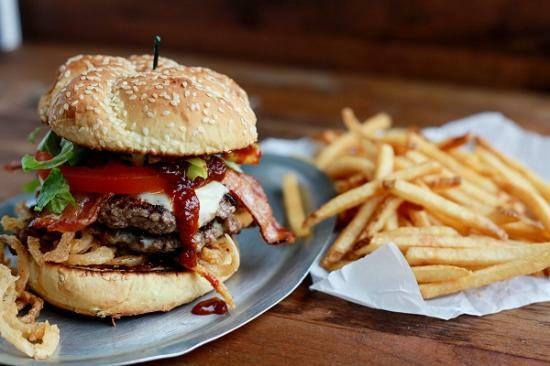 For this week's Burger of the Week, I am going to play the superstitious angle. Last season, the 5-6 Mountain Hawks travelled to Hamilton, New York as sizeable underdogs and pulled off the upset. To do my part for the Mountain Hawks' chances this weekend, I'm not changing my Burgers and Drinks from last season. I am absolutely going to not toy with the Supreme Being That Determines The Outcome Of Football Games, so in that vein I am going back to the #DOTW that was clearly the only reason that Lehigh won against Colgate last year - the simple drink I called the Hard Root Barrel. What's a hard root barrel? Start with some Jim Beam whiskey, one part, and add three parts olde tyme root beer. You can use something typical, like A&W root beer or A-Treat, but we used some freshly-brewed sassafrass-based Pennsylvania Dutch root beer instead, which is a bit more sugary than a commercial root beer but really works well with the whisky. Then just add ice, and you're good. If you're stuck, there's also a lot of commerical hard root beer varieties, too. But it doesn't compare, IMO, to ours. People think that games are won and lost due to student-athletes blocking, tackling, kicking, passing, and running at a high level, along with taking care of the ball, doing your 1/11th and giving it 110%, but I know that doing all those things are just a compelling theory as to why Lehigh wins football games, whereas I can point to conclusive statistics that demonstrate that every time I have had the "Hard Root Barrel" as the #DOTW, it has resulted in a win against Colgate, so what are you going to believe? As always, Drinks of the Week have a place in responsible tailgates, but only if you behave yourself, don't get behind the wheel while impaired (or worse), and are over 21. Please do that. And leave plenty of time to sober up.